For the best profit, should you sell your house as is or renovate? When Beth Ann Mayer first saw a house in Babylon Village a block from the train station last September, she fell in love with it instantly. “It was perfect, just what we were looking for,” says the 31-year old social media manager, freelance writer and first-time home buyer. Mayer works in New York City and rides the rails each day. She and her husband, Pete Mayer, 42, a lawyer with an office in Hauppauge, keep busy schedules and aren’t particularly handy. Although they still had six months left on their apartment lease, they had begun looking for a home to buy figuring it would take a while. They struck gold right out of the gate. The couple was so impressed they broke their lease early and moved right in. “We couldn’t be happier,” Mayer says. Sometimes it happens like that. Home sellers make a big investment in repairs and upgrades and a prospective buyer likes their style. But undertaking major renovations does not always bring a big boost in profit. Housing experts caution would-be sellers not to go overboard. 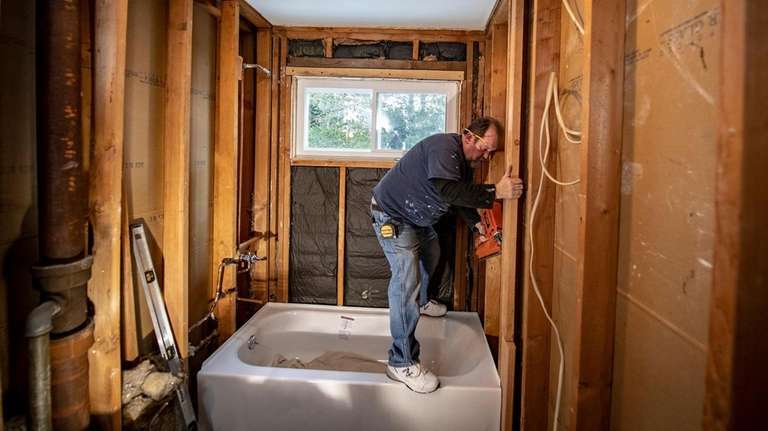 "If you want to sell a house fast, remodel the kitchen and bathroom or even fix a roof, but that isn't likely to bring you a windfall," says Bill Hogan, who owns Hogan Construction in Centereach, whose worker Jim Fitzgerald is seen here on a job in Smithtown. Photo Credit: Newsday/J. Conrad Williams Jr.
Bill Hogan, owner of Hogan Construction in Centereach, agrees with Pickman. 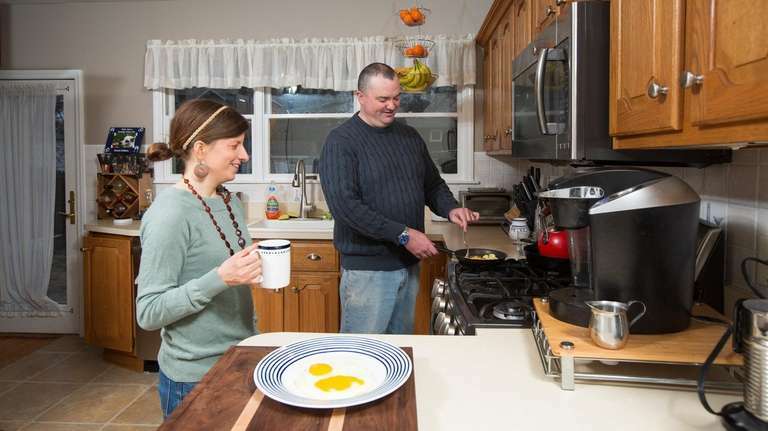 Hogan’s company specializes in home renovations but he also purchases and “flips” properties. 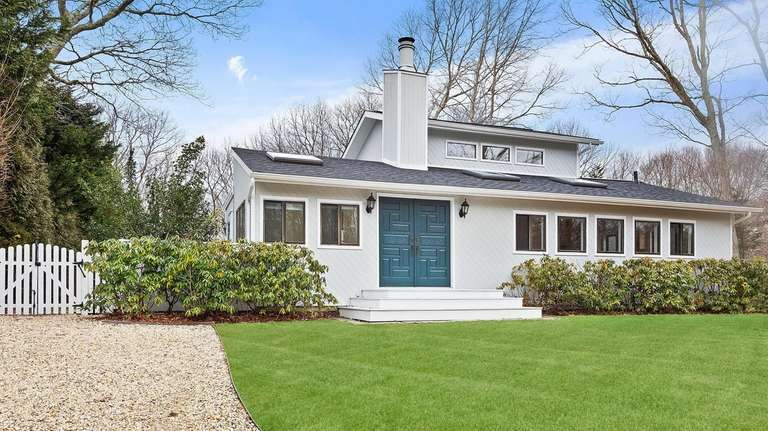 Val Allocco, owner of Staged 2 Sell NY, a home-staging company based in Northport, says she is more likely to invest in projects she believes will help a house show its best. Knowing your target market helps, too, notes Allocco. She says millennials want connectivity, a home office, closet organizer systems and a minimalist look. They like to be within walking distance of restaurants and stores, she says. Generation X is focused on family, requires more bedrooms, places for kids to play, and at least two bathrooms, she adds. Finally, says Allocco, older couples exploring age 55-and-over communities want a master bedroom on the ground floor and amenities such as indoor and outdoor pools or golf. Brockman notes that buyers are going to have their own visions of how a home should look, so let them undertake major changes and renovations. Spend your money, she advises, on making sure the window trim is neat and that cracks and holes in the walls or ceiling are fixed. Splash a little paint where needed. Bright colors are best, she says, because it makes the walls look larger. Refinish wood floors. Change your outdated faucets, but don’t knock down the shower. Just as important, she emphasizes: make sure your home smells good when somebody comes to look at it. Realize that little things can make a big difference but also that the price of “sprucing up” should not exceed the home’s equity in comparison to the current market value..
Glenn Albright, 53, and his wife, Susan, took a compromise approach when they put their Southampton home on the market in early March. Priced at $895,000, it’s in good shape and in a prized neighborhood, but the kitchen and bathrooms need updating, says Aleksandrina Penkova, who represents the listing with Raphael Avigdor for Douglas Elliman Real Estate. “The front door should be painted or stained to look fresh. All hardware should be new, too. The outside lighting needs to be current. These are inexpensive fixes. Get rid of clutter — and be sure to put away your valuables before any showings.” --Shirley Brockman, Brockman Consultant and Real Estate Services, Hempstead. In some cases, major renovations are necessary or at least justified before putting a home on the market -- plumbing problems or a leaky roof, for example, real estate experts say. Others, such as kitchen and bath remodels, are optional projects that may be undertaken or avoided for a variety of reasons with decisions made on a house-by-house basis, they add. Before starting such projects, however, some research or a consultation with a home contractor or designer is a good place to start, they say. Looking online is one way to see what’s trending. In a recent study on kitchen trends, the website www.houzz.com, which connects homeowners with design and construction professionals, provides articles and advice on home remodeling and renovation projects, and also sells some home products, found that more than half of upgraded faucets are high-tech (57 percent), boasting water efficiency, no-fingerprint coating or touch-free activation. Other high-tech features such as wireless controls (16 percent) in upgraded appliances and home assistants (31 percent) in upgraded electronics are growing in popularity. Black stainless steel appliances now appear in one in 10 upgraded kitchens and engineered quartz (48 percent) surpassed all natural stone materials combined (43 percent) in popularity, paving the way to increasingly white countertops. Similarly, engineered flooring, such as engineered wood, vinyl and laminate, has become nearly twice as popular (40 percent) as natural hardwood (24 percent) floors. How much can you recoup on home improvement projects? In its 2019 Cost vs. Value Report, Remodeling Magazine, which provides business tools, product information, design ideas, cost-estimating tools, and management advice to full service remodeling businesses compared the average cost for 21 popular remodeling projects in 149 markets with the value those projects retain at resale in 100 U.S. markets. 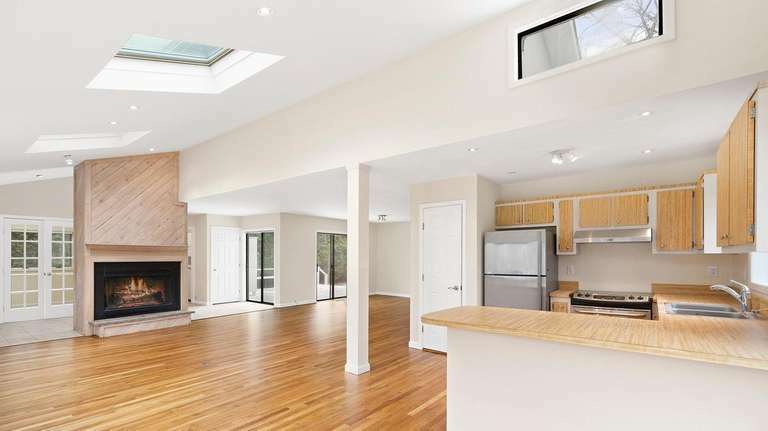 Here’s the “costs recouped” results for several common home remodeling projects.